Strawberry limemade is one of my favorite summertime drinks. Like strawberry lemonade, strawberry limemade combines fruity strawberries and zesty lime juice for a drink that is sweet, tart and very refreshing. 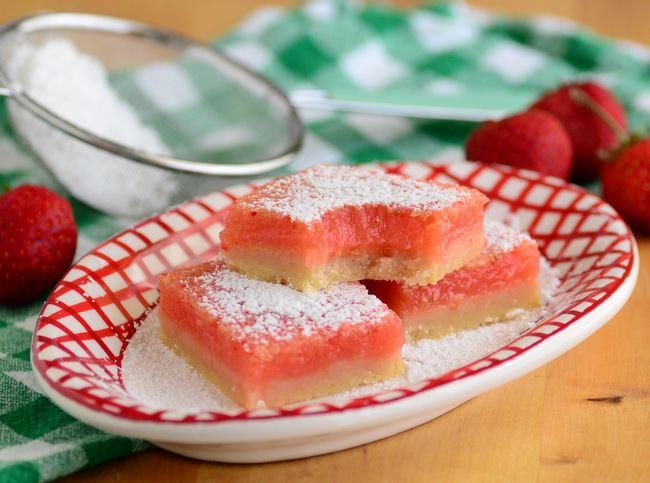 I used those same ingredients to make these very summery and delicious Strawberry Lime Bars, too! The bars start with a filling that is similar to the filling of a lemon bar. 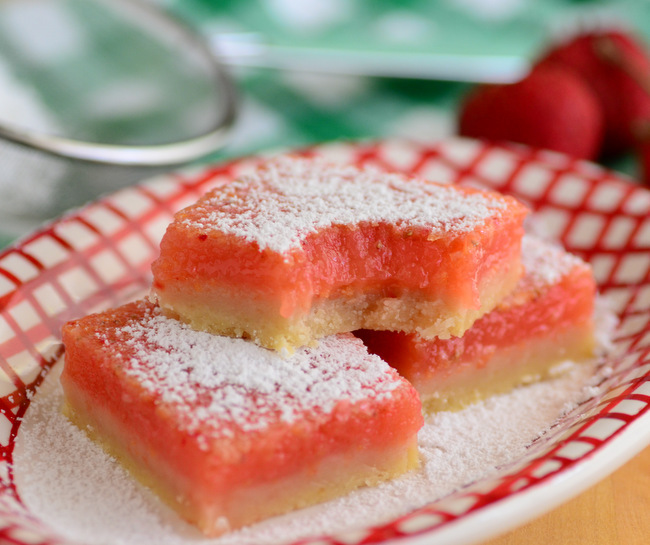 It uses lots of fresh lime juice, eggs and sugar, along with a generous amount of strawberry puree. You can puree your strawberries – you will likely need a heaping 1/2 cup or so, but it depends on the size of your berries – in the blender or food processor to make your puree. The seeds do not need to be strained out, however there should not be any large chunks of fruit left from the berries. The puree is whisked together with the other filling ingredients to make a bright pink mixture that serves as the topping for the bars. It may seem like there is a lot of sugar in the filling recipe at first glance, but both strawberries and limes can be quite tart. The sugar not only helps to give the bars their creamy texture, but it amps up the flavor of the strawberries and balances the flavor of the bright limes. The finished filling has just the right amount of sweetness to make it downright addictive once you take that first bite. The filling sits on top of a buttery shortbread crust that is pressed into the pan and pre-baked. The filling is added while the base is still hot from the oven, which really streamlines the baking process. The crust has a hint of crispness to it, but is still easy to slice into neat pieces without the bars crumbling apart. The bars, however, need to be refrigerated after baking so that the filling has a chance to set up fully. The bars should also be refrigerated before (and after, if there are leftovers) serving to maintain their texture and refreshing flavor. Preheat oven to 350F. Line 9×9-inch baking pan with aluminum foil and lightly grease. Make the crust. In a large bowl, whisk together flour, sugar and salt. Add softened butter and blend in with an electric mixer at low speed until mixture forms coarse, sandy crumbs. Pour into pan and press mixture firmly down (with your fingers or the back of a spoon) into an even layer. Bake for 16-19 minutes, until just lightly browned around the edges. Make the filling. When the crust is just finished baking, or has only one minute to go in the oven. Whisk together all filling ingredients in a large bowl until well-combined, about 1 minute. Pour filling mixture into the hot crust and immediately return to the oven. Bake for about 20 minutes, or until filling is just barely set (it will still jiggle when the pan is moved and may begin to turn a very light brown on top). Cool completely and refrigerate for at least 3 hours, or until well-chilled, before slicing. Top slices with confectioners’ sugar to serve. I love strawberry and lime together! These bar look fabulous!